What’s in the British Army’s Black Bag? It goes without saying that the most important aspect of any deployment of troops is the nature of the troops themselves. In this regard, the British Army has an enviably high reputation. Across the globe our troops are regarded as amongst the best there are and often, indeed, the very best. Even the best troops might struggle if they don’t have the right equipment however, and that’s where the Black Bag comes into its own. When new recruits arrive to train at ATC Pirbright, they are expected to bring a broad range of items of kit, including a sewing kit, a boot cleaning kit, a torch, 10 tent pegs and 6 padlocks. By the time they’re being deployed in a combat zone such as Afghanistan, on the other hand, they receive the legendary Black Bag, a super-sized hold-all with an 80litre capacity. The comprehensive nature of the contents of the Black Bag initially arose from the experience of troops deployed to Iraq in 2003, who found that an under-prepared supply chain had left them hugely ill-equipped. The response from this, over several years, was to develop the Black Bag, which currently contains several thousand pounds worth of equipment, running from six types of footwear through a thermal mug and torch and multi-tool kit, all the way to antibacterial underwear. Items in this section include socks, a t-shirt and combat underwear. In case you’re wondering what ‘combat underwear’ consists of, it’s a pair of antimicrobial pants. These are pants constructed from material which has similar properties to medical dressings. The practical impact is a pair of pants which can safely (and more to the point cleanly) be worn for several days at a time, even in the heat of an overseas deployment. As well as items such as caps, hats and gloves which protect against heat or cold, this part of the Black Bag also contains several items – such as warm weather trousers and shirts – which have been treated with Permethrin. This is an insect repellent which stays in the garments through six months of sweating and laundering. 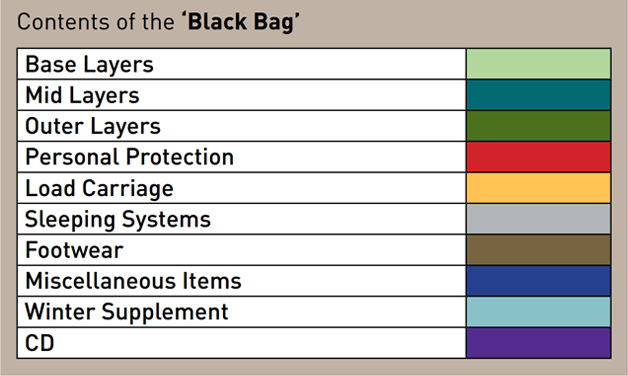 This is perhaps the most vital part of the Black Bag – the items which play a vital role in keeping each member of personnel safe from harm. These items include the MK7 helmet, which, as well as offering ballistic protection, was modified in 2009 in order to be lighter than previous helmets. Another aspect of the latest design was a shape which could be worn whilst lying flat and shooting without running the risk of it slipping forward over the troop’s eyes. This section of the Black Bag consists of several items, including a Mollé Belt Ensemble, a 45 litre pack and an ammunition grab bag. Used together these pieces of kit will enable a soldier to carry everything they need in order to operate for 48 hours. This will include items such as cooking equipment, food, water, ammunition and communications equipment. The footwear in the Black Bag ranges from lightweight sandals to combat boots. The latter are manufactured by either Meindl or Lowa, and are favoured by not only the military, but hikers, mountaineers and members of the media. The bits and pieces that make life on the front line a little bit more comfortable. These include bath towels, a boot brush, two types of sweat rag (tropical and desert) and a hydration system. The hydration system carries three litres of water and comes with its’ own special cleaning kit. Finally, because the conditions which troops face range from blisteringly hot to below freezing – even within a single territory such as Afghanistan – the Black Bag contains a winter supplement, including gloves, hats and socks which are guaranteed 100% waterproof and are lined with the wool of the merino sheep. These are particularly hardy creatures live amidst the freezing slopes of New Zealand’s Southern Alps. The wool which keeps these sheep warm in winter and cool in winter is now wrapped snugly around the feet of our troops.